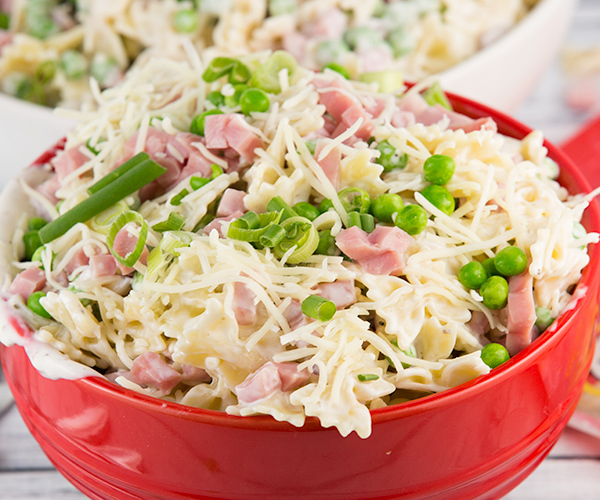 Creamy Ham and Cheese Pasta Salad is the perfect pasta salad made with a mayonnaise based dressing. Baby Peas add a bright pop of color and crunch. It’s simple and easy and comes together quickly. Pasta salads and macaroni salads go hand in hand with spring and summer, but truth be told, I love a good pasta salad all year round. I have so many favorite pasta salads like this Easy Macaroni Salad and this BLT Pasta Salad. Pasta salads are so versatile because you can use a variety of veggies, proteins like chicken and ham, add in cheeses, and change up the dressing and use anything from Italian dressing to mayonnaise based dressings. 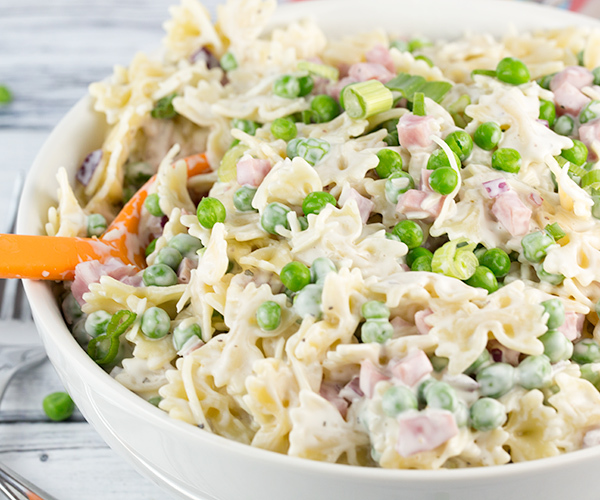 This recipe for Creamy Ham and Cheese Pasta salad includes all of the pasta salad essentials. For starters, can we just mention how well ham and cheese go together? Whether it’s ham and cheese sandwiches, sliders, or ham and cheese pinwheels, there are so many options where this particular combination of ham and cheese is perfection. For vegetables, I used bright green baby peas for color and that little crunch you get when you bite into a pea. I also included just a bit of finely diced red onion, but not too much so that it’d be overbearing. Ham is a great addition to any pasta salad, but especially one with cheese. Ham and cheese always go well together. I used diced ham, but you could also use larger chunks or even sub chicken for the ham. Horizon Organic Shredded Cheddar Cheese provides the cheesy goodness I was looking for. 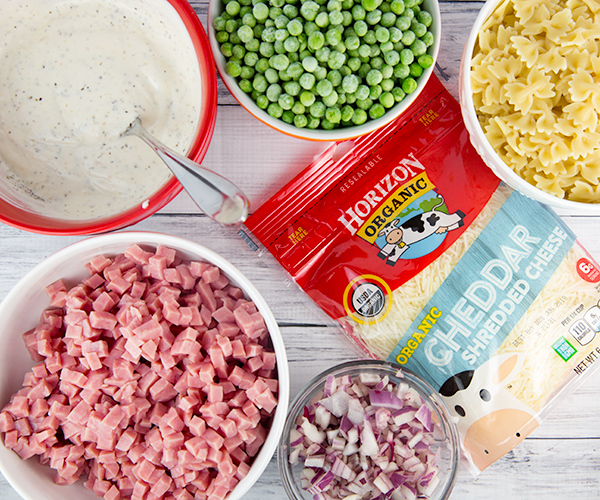 While I used cheddar cheese, Horizon Organic has a variety of shredded cheeses that you can choose from that would all work well in this recipe. The dressing for this Creamy Ham and Cheese Pasta Salad is made very simply with mayonnaise, and ranch dressing. My homemade ranch dressing works well here but any bottled ranch dressing of your choice if fine too. Lastly, let’s talk about the pasta. I used mini farfalle (the little bow-tie pasta) but feel free to use whatever you have in the pantry like macaroni, rotini, penne. My little guy loves the bow tie pasta (farfalle) which is why I used it here but the choice is yours! 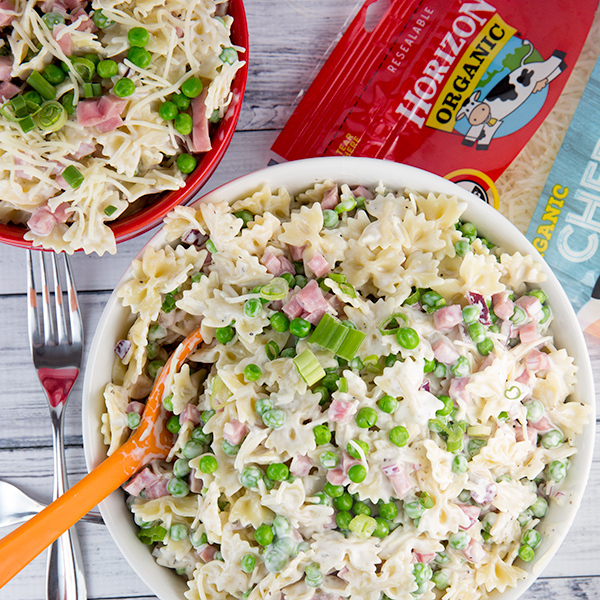 Creamy Ham and Cheese pasta salad will make a great addition to your next picnic or potluck, and it also works well as a simple summer weeknight meal. Or, if you’re like me, you’ll make it all year round. This is a sponsored conversation on behalf of Horizon Organic. Thank you for supporting the brands that make CenterCutCook possible. Cook pasta according to package directions. Drain and run pasta under cold water until it has cooled completely. In a large bowl, whisk together mayonnaise, ranch dressing, fresh lemon juice, apple cider vinegar, salt and black pepper. Add the cooled pasta to the bowl. 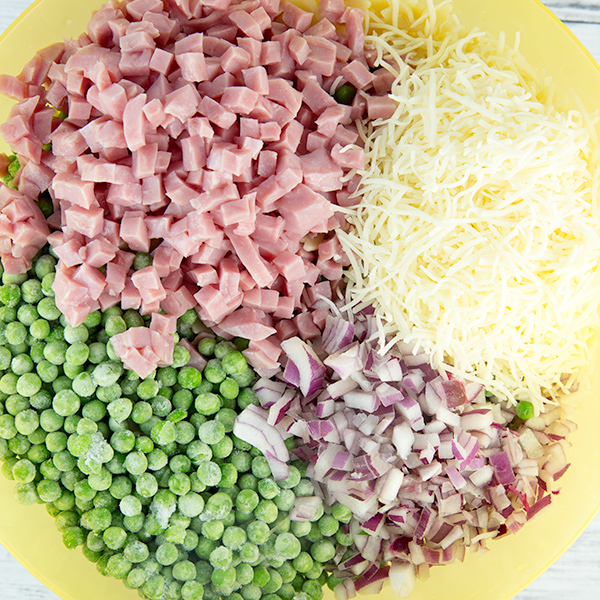 Stir in ham, Horizon Organic Shredded Cheddar Cheese, peas, and diced red onion. Garnish with chopped green onion and additional Horizon Organic Shredded Cheddar Cheese.